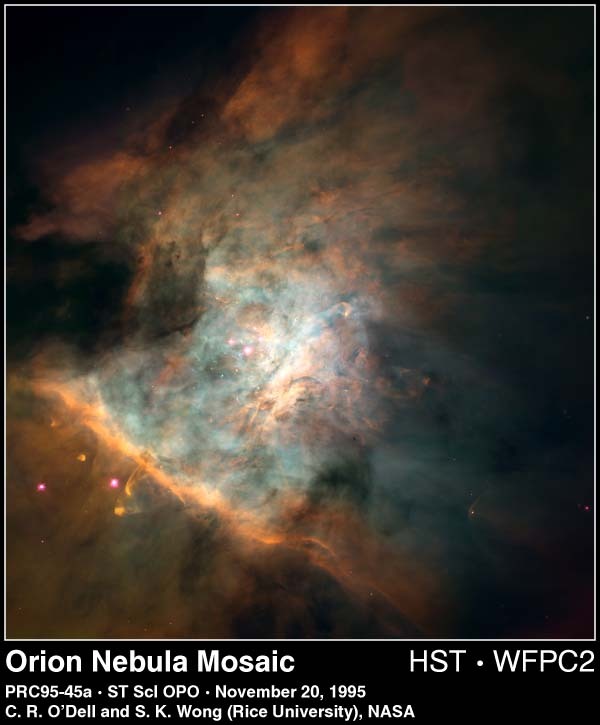 Orion Nebula M42 Hubble pictures: Panorama with Trapezium, protoplanetary systems, edge-on disk. Other HST pictures of M42: Pre-repair, proplyd discovery, January 1997, May 1997 (OMC 1 with NIC), August 2000 (Trapezium in IR), April 2001 (Proplyds under hot radiation). This color panorama of the center the Orion nebula is one of the largest pictures ever assembled from individual images taken with NASA's Hubble Space Telescope. Seamlessly composited from a mosaic of 15 separate fields, it covers an area about five percent that covered by the full Moon. The seemingly infinite tapestry of rich detail revealed by Hubble shows a churning turbulent star factory set within a maelstrom of flowing, luminescent gas. 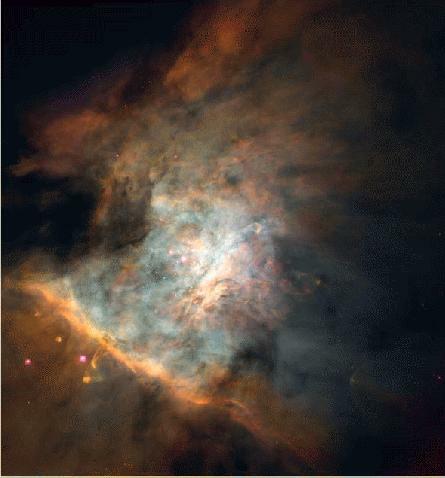 Though this 2.5 light-years wide view is still a small portion of the entire nebula, it includes almost all of the light from the bright glowing clouds of gas and a star cluster associated with the nebula. Hubble reveals details as small as 4.1 billion miles across (less than the distance of Neptune from the Sun). 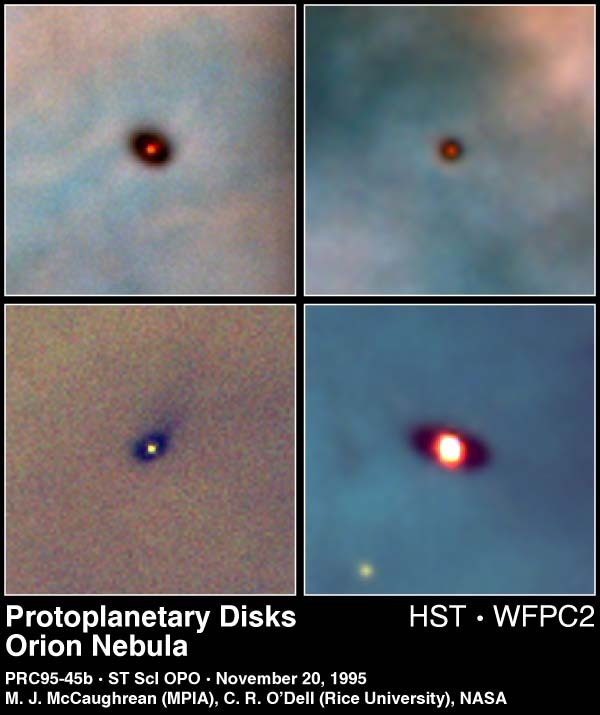 These are HST images of four newly discovered protoplanetary disks around young stars in the Orion nebula, located 1,500 light-years away. Gas and dust disks, long suspected by astronomers to be an early stage of planetary formation, can be directly seen in visible light by Hubble. Each image is 167 billion miles, or 257 billion kilometers across (30 times the diameter of our own solar system). The disks range in size from two to eight times the diameter of our solar system. The researchers explain the different circular or elliptical shapes as being due to the fact that each disk is tilted toward Earth by different degrees. Resembling an interstellar Frisbee, this is a disk of dust seen edge-on around a newborn star in the Orion nebula, located 1,500 light-years away. Because the disk is edge-on, the star is largely hidden inside, in this striking Hubble Space Telescope picture. The disk may be an embryonic planetary system in the making. Our solar system probably formed out of just such a disk 4.5 billion years ago. At 17 times the diameter of our own solar system, this disk is the largest of several recently discovered in the Orion nebula. 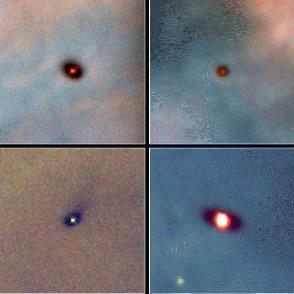 The left image is a three-color composite, taken in blue, green, and red emission lines from glowing gas in the nebula. The right image was taken through a different filter, which blocks any bright spectral emission lines from the nebula, and hence the disk itself is less distinctly silhouetted against the background. 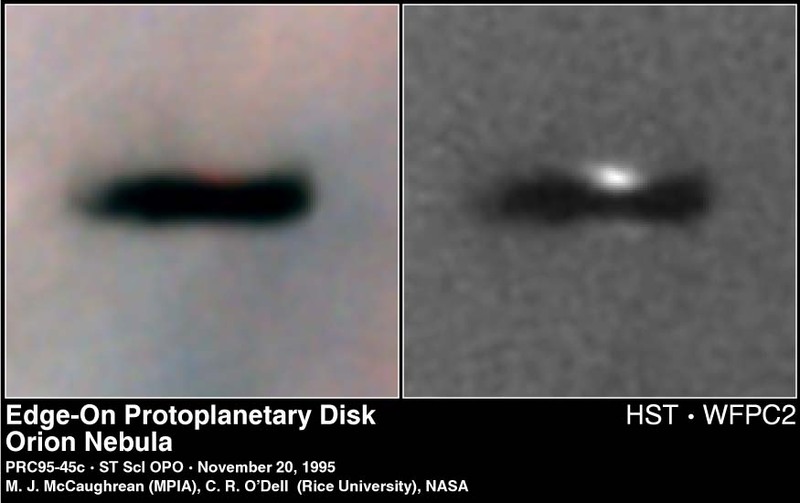 However, clearly visible in this image are nebulosities above and below the plane of the disk; these betray the presence of the otherwise invisible central star, which cannot be seen directly due to dust in the edge-on disk. The images were taken between January 1994 and March 1995, and a study of their characteristics has been submitted for publication to the Astronomical Journal.